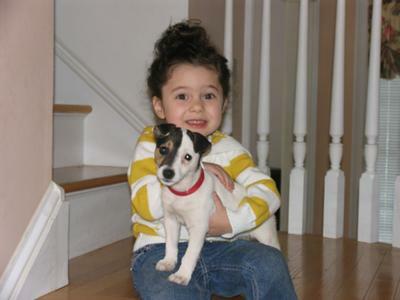 This is a picture of my daughter Kaelyn and our new puppy Annie. We have had her only 8 weeks but already she is a member of the family. We have been having a little trouble housebreaking her because she doesn't make a very loud announcement when she needs to go but we hope to shortly have her trained. It will be great just letting her roam the house. We were initially concerned because there is so much bad publicity about these little guys on-line that we were concerned that we had made the wrong decision by choosing her, but she has been a little angel, well most of the time. She is very playful and energetic and matches our children. I sometimes comment to coworkers that we chose a dog just like our kids, "what were we thinking" ha, ha, ha.